Republicans and Democrats came together Thursday night at Nationals Park to play ball and help raise funds for charity. 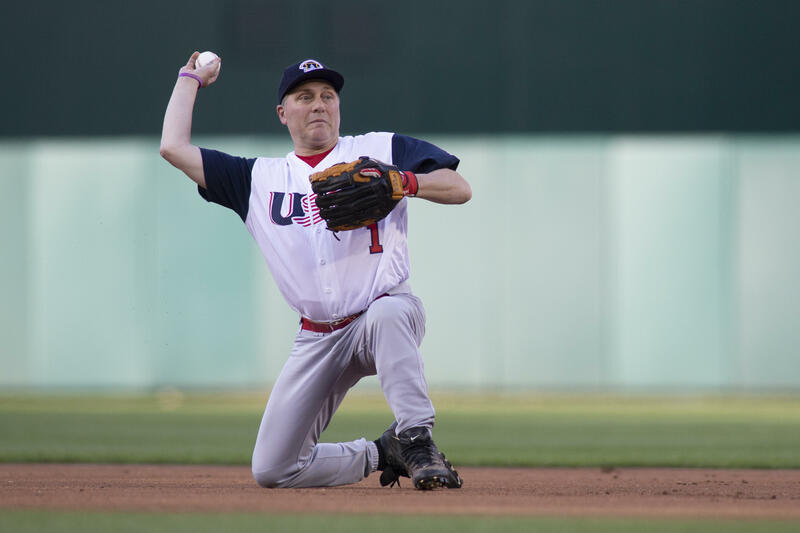 The annual congressional baseball game in Washington kicked off with House Majority Whip Steve Scalise -- who was shot during practice last year in Alexandria, Virginia -- fielding a ground ball and throwing out the first batter of the game. Ultimately, the Democrats defeated the Republicans, 21-5. Moments after the play, teammates and colleagues swarmed the Louisiana congressman. Scalise was escorted earlier in the game to second base by two U.S. Capitol Police officers who were also wounded when responding to the shooting one year ago. The crowd gave Scalise a standing ovation when he left the field after the second batter. Scalise suffered life-threatening injuries when a gunman opened fire June 14, 2017, striking four people. He spent the past year re-learning how to do everything from walking to playing ball. After the exhausting recovery, and just two months from his most recent surgery, the GOP's star player is helping keep the more-than-100-year baseball tradition alive. Scalise was walking with the help of one crutch prior to Thursday's game, but took to the field without it. "I can't move the way I used to ... It's better than it was a few weeks ago, but, you know, if the ball's a few feet away from me it's not as easy to get to," Scalise told "CBS This Morning" earlier Thursday. The Democrats won last year's game 11 to 2, according to CBS affiliate WUSA-TV. This year, both sides predicting a win. "We're all Americans, we all love the game of baseball. And we're all out to have fun for one night," said congressional aide Zack Barth, who was also shot in 2017. Baseball is a big deal for the Louisiana lawmaker, who had been considered his team's best player, and his recovery has been celebrated by both sides of the aisle. Democratic players set aside a century-old rivalry last week and welcomed Scalise to their practice, but the stepped-up police presence was hard to miss. "Has anything changed over the past year that would make not just members of Congress, but all Americans, safer from gun violence?" CBS News' Nancy Cordes asked. "You know this event was unique, I mean, you see mental illness becoming a bigger focus, which I think is a good thing," Scalise said. His pro-gun rights stance hasn't changed, which doesn't surprise his good friend and fellow Louisianan, Democrat Cedric Richmond. "In his case, there were two people that with guns were able to save him and his team," Richmond said. "To me, this happens far too much in our country." In the year since the Alexandria shooting, mass shootings have occurred at a Texas church in Sutherland Springs, a Las Vegas music festival and high schools in Parkland, Florida, and Santa Fe, Texas.